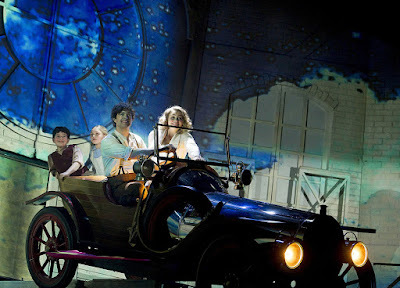 There's an aura of timeless quality that pervades the touring production of Chitty Chitty Bang Bang, currently in its second week at Wimbledon. Ian Fleming's wonderfully imaginative tale, so quintessentially English, married to the universal appeal of the Sherman Brothers' songs has made for a 20th century fairy tale that ranks alongside the classics. Notwithstanding it being a warm July evening, the New Wimbledon theatre was filled by a generation-straddling audience. And in a production that makes intelligent use of projected graphics, there's a wholesome accessibility to the tour that makes it both affordable and reachable across the country - a pleasing contrast to the eye-watering ticket prices of so many West End shows. The current cast are a delight. Lee Mead is the handsome widowered single dad - getting by with his crackpot inventions and instilling in his kids a decent sense of right and wrong and above all a belief in the power of imagination - and in that way, much like Peter Pan, a good production of Chitty (and this is a very good production) can speak to the child in all of us. Mead has his faithful following, but his take on Caractacus Potts' signature melodies (Hushabye Mountain, poignantly enhanced by the appearance of his late wife) is powerful and assured. Opposite Mead, Carrie Hope Fletcher is Truly Scrumptious and who in a real life tale of theatrical romance was herself the young Jemima Potts when the stage show first opened at the London Palladium. As ever, Fletcher brings an ethereal charm to the role. Exquisite vocals - and what a delight to see the movie's Lovely Lonely Man, a song dropped from the stage show until now, restored (albeit now set in the Toymaker's workshop) to the libretto. And of course her doll impersonation with immaculate robotics and enchanting lyrics in Doll On A Music Box is as faultless as one might expect. Stephen Mear's choreography gorgeously enhances the piece, with his work on the larger routines (The Bombie Samba and some fun tap work in Me Ol' Bamboo particularly excellent) being perfectly drilled visual treats. But it is his styling of (Matt Gillett as) the Childcatcher's entrapment of the Potts kids, that so evokes Robert Helpmann's terrifying cameo in the movie, and further defines Mear's remarkable calibre. But as a familiar, family escape from some ghastly world affairs there's truly nothing better than this show. Down in the pit Andrew Hilton's orchestra make fine work of the Shermans' ditties, whilst onstage (and to use the vernacular) that iconic, fantasmagorical car - and yes, it really does fly - will have the kids wide-eyed in awe. The spontaneous standing ovation at the curtain call spoke volumes. Just go!